The Cesnola Collection of antiquities from Cyprus was one of the earliest acquisitions by The Metropolitan Museum of Art. In 1872 – two years after its founding – 275 crates of objects were purchased and brought to the Museum by Luigi Palma di Cesnola, who soon became its first director. This collection, with over 6,000 works, documents the art of Cyprus from ca. 3000 B.C. through ca. A.D. 300 in all major media – terracottas, bronzes, gems, glass, silver and gold plate, and jewelry. The distinction of the collection, however, lies in the stone sculptures that are unequalled in any other institution and that are beautifully illustrated and cataloged in this unique publication. The 635 large-scale stone sarcophagi, funerary monuments, and votive sculptures, primarily of the sixth through fourth centuries B.C., testify to the wealth and power of the individuals that commissioned them. The exceptional variety of types reflects the succession of rulers that dominated the island and exploited its resources, and shows influences of the cultural exchanges with other great early civilizations across the Mediterranean. 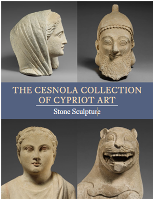 The Cesnola Collection of Cypriot Art : Stone Sculpture is the first comprehensive publication of these works of art, and is available to read, download, and search online at no cost. A paperbound volume, complete and printed in full color as a print-on-demand (POD) book, is also available for purchase and can be ordered at the Yale University Press URL address at left, or through most online booksellers. Additional information about the publication – including links to related resources, such as current records for every Cypriot stone sculpture in the Metropolitan Museum’s collection database – can also be found on the Museum’s MetPublications website.